FEIASOFI - Federación Iberoamericana de Sociedades de Física - Federación Iberoamericana de Sociedades de Física ) para evaluar la factibilidad de los mismos. The goal of this Summer School is to explore how physical concepts and tools expand our understanding of the complex functions and organization of living systems. By bringing together leading scientists who work at the interface of both disciplines, the School will offer a comprehensive view of some of the more interesting open problems in Biology and how they can be approached (and experimentally tested) from a physics perspective. SIAM Workshop on Network Science, July 15-16, 2016. NetSci 2016 will take place in Seoul, South Korea. During a span of five days (May 30-Jun 3) we will be hosting the NetSci school, satellite symposia, and the regular conference. Please mark your calendars! We hope to see you all next year in Seoul, the Soul of Asia! 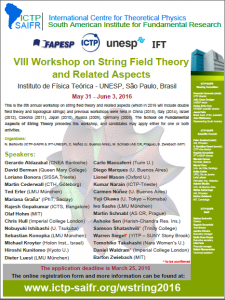 This is the 8th annual workshop on string field theory and related aspects (which in 2016 will include double field theory and topological strings) and previous workshops were held in China (2015), Italy (2014), Israel (2012), Czechia (2011), Japan (2010), Russia (2009), Germany (2008). The School on Fundamental Aspects of String Theory precedes this workshop, and candidates may apply either for one or both activities. The next European Fluid Mechanics conference, EFMC11, will be held at the Barceló Sevilla Renacimiento Hotel between September 12th and September 16th 2016. The abstract submission and the registration proccesses open today, November 16th 2015. Please, visit our web site www.efmc11.org for details about the program, invited speakers, minisymposia, lodging, travel options and registration fees.